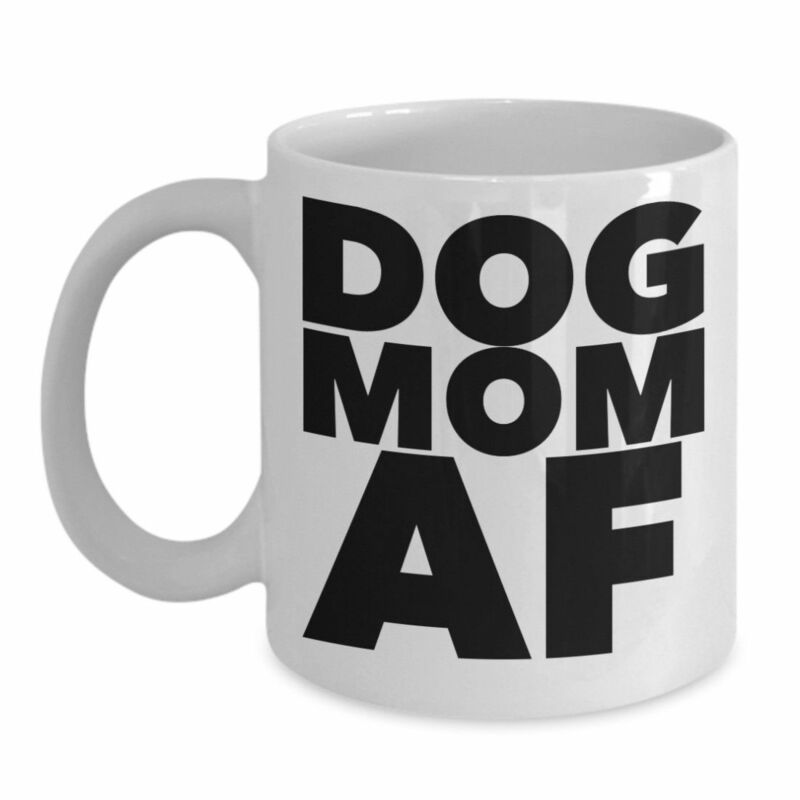 DOG MOM AF - this coffee mug declares in big, bold letters that you are Dog Mom AF **NOT SOLD IN STORES** All our products are our own original designs. * Permanent double-sided design - not a cheap sticker * Great for everyday use or as a gift for a friend or loved one. 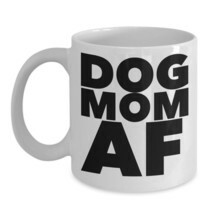 * 11 ounce or 15 ounce lead-free ceramic mug feature comfortable C-handles. * Dishwasher and microwave safe. * Highest quality printing ensures excellent durability - it will never fade. * Securely packed in custom-made styrofoam packaging for break-free shipping. * Printed in and shipped from the USA. * Satisfaction guaranteed. * Not available in stores. * Treat yourself or a loved one to happy mornings with these unique coffee mugs. Click "Add to Cart" now! Check out more great gifts ideas here at It's A Gift. * Customer satisfaction is extremely important to us. If you have any problem with your order, please contact us right away. Please do not leave negative feedback before we have the opportunity to resolve any issues. If you are happy with your purchase, please leave us positive feedback. If you're shopping for a great gift our novelty mugs are sure to be a hit. This mug is a great gift idea for anyone who loves coffee, hot chocolate or tea. Perfect for him or her on their birthday, Christmas, Valentine's Day, Mother's Day, Father's Day, graduation, anniversary, wedding, or just because. Makes a great kitchen decoration, too. *Design may vary slightly from the photograph due to monitor differences and that each are made per order just for you! International Buyers: Import duties, taxes, and charges are not included in the item price or shipping cost. These charges are the buyer's responsibility. Please check with your country's customs office to determine what these additional costs will be prior to bidding or buying. Any delays due to customs are, unfortunately, out of our control.